It is. Well, that and I used a completely different cookie recipe as my base, one that contains both oatmeal and pecans in addition to the chocolate chips. The resulting cookie is exactly the kind of chocolate chip cookie I like to eat — thick and dense and chewy with melty bits of chocolate, crunchy pecans, flecks of mellow oatmeal, and the delicate sweetness of shredded zucchini. Plus, no slime. 1) Preheat your oven to 375°F and lightly butter two cookie sheets. 2) Grate the zucchini using a food processor or box grater to yield 1 c. grated zucchini. Toss the zucchini with 2 T. of sugar, transfer to the mixture to a fine-mesh strainer and set it over a bowl to drain for at least 30 minutes. This draws moisture out of the zucchini and prevents the cookies from becoming cakey and slimy, so don’t skip this step. 4) In a medium bowl, whisk together the remaining dry ingredients and set aside. 5) In the bowl of your food processor (or of an electric mixer fitted with the paddle attachment), process or mix the butter until it’s light and fluffy. Add the oatmeal-sugar mixture in three stages, mixing well after each addition. Add the egg and vanilla and mix until well incorporated. Add the dry ingredients in three stages, mixing just until blended. If you’ve done all this in the food processor, transfer the batter to a large bowl and stir in the chocolate chips and nuts, otherwise just stir the chips and nuts into your mixing bowl. 6) After the zucchini has drained, squeeze it between several layers of paper towels or cheesecloth or a dishtowel to absorb excess moisture. You want to remove as much moisture as possible, so you’ll have to work at it a bit. Fold the shredded zucchini into the cookie batter. 7) Drop rounded tablespoons of dough onto the prepared cookie sheets, spacing them about an inch or two apart. They’re not going to spread much so they don’t need a whole lot of room. Bake for 18-20 minutes or until the edges begin to turn golden brown. Remove the cookies from the oven and cool on the sheets for 2-3 minutes before removing to a cooling rack. I think these taste best slightly warm, when the inside is still a bit melty and the outside is still a bit crisp, but they’re also quite nice completely cool and pretty tasty even when frozen. This entry was posted on September 4, 2009 by Megan @ When Harry Met Salad. It was filed under baked goods and was tagged with chocolate chips, cookies, oatmeal, summer, zucchini. Your cookies seems so different. I didn’t see any cookies like yours. If I can find the ingredients in my country, I will try. Thanks for recipe. These are even better than chocolate zucchini bread. They look luscious! waw!! These cookies look so appetizing!! Quince? Fennel? Roooootabega? Heavy Cream! I know you got it in you, I mean you must be eating something delicious. I miss me some Kissing Forks news. That was a bit of a long hiatus, huh? But yes, fennel. . .comin’ right up. Thanks for hanging in there. My mouth is watering; these look delicious…what a beautiful photograph! I made these cookies and they were amazing. Thank you so much for everything! I made these after searching long and hard for exactly this kind of recipe. Holy crow, are these amazing! What a wonderful job you did with this recipe! I didn’t add as much chips or nuts because I don’t like my cookies to be terribly loaded down. I did, however, use walnuts in addition to the pecans. These were just simply amazing. Everyone keeps asking and asking for them! This recipe is staying right in my recipe box for safe-keeping! Made these cookies this am and they are very good. My son loved them and couldn’t believe they were made with zucchini. This recipe is a keeper ! 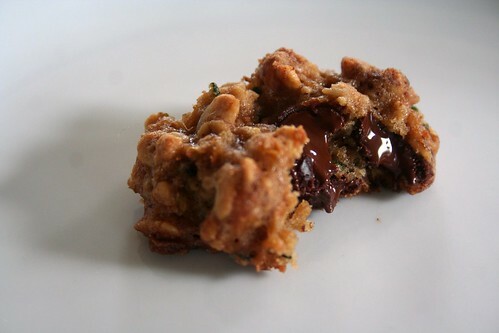 My new favorite cookie – We have loads of zucchini and I’m making my second batch! They were a hit with the family. Thanks! These are delicious, however a laughable use of zucchini. After they drain, it’s one small handful to a giant bowl of dough! thank you for sharing this recipe. I made these cookies today and they are absolutely delicious. I will use this recipe from now on! YU-UM! These are really delicious! Mine did spread out, not so much that they joined but they’re definitely flat. Crispy on the outside and soft inside…perfect! I guess because they flattened they only took about 12 minutes which is, in my opinion, a real plus;) I’ll make a double batch next time and maybe add more zucchini but they’re just so good I don’t know if I want to mess with them. Thank you, thank you! MIne came out thin and baked together…like one big cookie. Ok…. I am so gonna try this! Just found your blog, made these tonight (wheat flour and half butter subbed with applesauce). Freaking amazing! Thank you! In the bowl of your food processor (or of an electric mixer fitted with the paddle attachment), process or mix the butter until it’s light and fluffy. 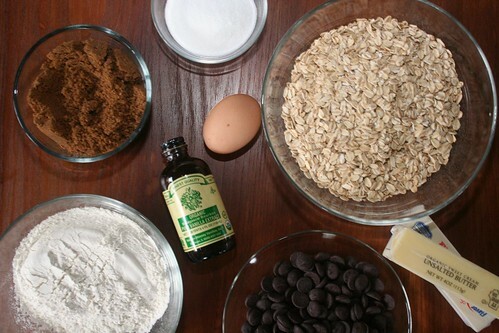 Add the oatmeal-sugar mixture in three stages, mixing well after each website design. it is a fav recipe for child however mine came out thin and baked together…like one big cookie. Barbecue beef brisket is the national dish of the Republic of Texas. Here’s the recipe for How to smoke spare ribs it the way the BBQ champions abd BBQ restaurants cook it. Learn how to grill Brisket steak in best weather now!